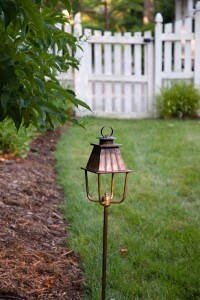 Exterior lighting is thankfully no longer limited to the typical wall fixtures and light posts. 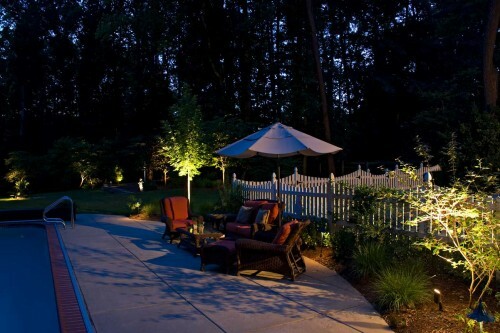 With the use of low- voltage systems and LED options outdoor lighting now has almost limitless possibilities. These lighting systems have flexible options for general lighting and creating special effects. Used for drama, accent, safety, security, and even under water, exterior lighting is a versatile and artistic landscape design element. It’s no surprise that a well-designed lighting system adds curb appeal and property value by enhancing the site and architecture of your home. Crafting a natural effect from an otherwise dark, blank canvas is the goal of quality lighting design. 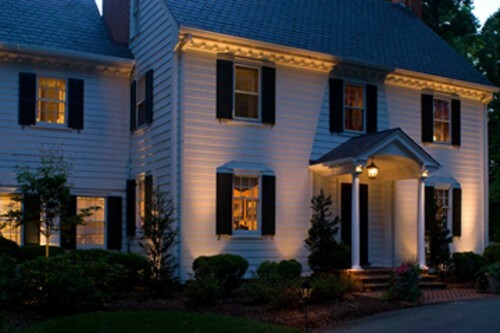 Features of your home’s exterior beautifully come to life with the appropriate use of exterior lighting. 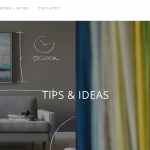 Your home and landscape most likely already have a theme, rhythm and special features to highlight even though they may not be obvious at first glance. The design should be responsive to that while complementing and balancing the scale and character of the surroundings. With thoughtful analysis and fixture selection, some wonderful effects can be achieved. Often there are surprise, secondary and subtle outcomes that are not anticipated in planning, such as interesting shadows, rhythmic patterns, or the twinkling sparkle of a reflective object. Uplighting adds height and dimension by raising the eye skyward. It is a great choice to accentuate posts or columns, walls, or corners of the home or structure. It can also emphasize architectural features such as trim details and unique elements. Uplighting trees can bring attention to interesting bark texture and the sculptural form of the trunk, branches, and foliage that might otherwise go unnoticed. Downlighting, a.k.a. “moonlighting” or top-down lighting, is especially effective for creating a subtle, ethereal setting under a large deciduous tree. A seating arrangement under the tree canopy is the perfect setting for a tranquil or romantic evening retreat. At least two fixtures are typically necessary to create this effect and should be mounted about 25’ above the ground. Moonlighting can also be used to light large expanses of open areas by mounting fixtures in surrounding trees. Path lighting provides important safety and directional cues. Unlike other landscape lighting, pathway fixtures come in all types of designs and finishes, adding a pretty, decorative motif. The lighting pattern may produce a soft glow, attractive scallop patterns, and perhaps accentuate an interesting texture of a stone or pebble surface. Accent lighting has a myriad of uses, including grazing the surface of shrubs and highlighting seasonal foliage and flowers. 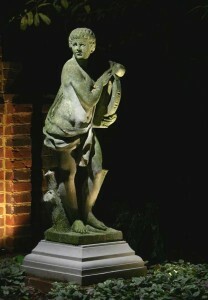 It is powerful for calling attention to focal points such as a fountain or piece of statuary. Thank you to Inaray Lighting and Lighting by Design, both of Richmond, VA, for providing the photos. Images are copyrighted, as are all images appearing in the FORM & FUNCTION blog. Light Up the Night… part II coming next! Early, middle, or late- blooming, that is!